Bronze Bronze is a Good website with an easy to navigate interface. Fast loading pages. Average amount of content. A few invalid links/under construction. A way to contact the Troop, Webmaster, Scouts, etc. 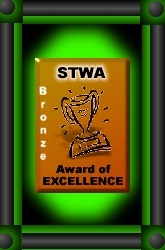 STWA does not give many bonus points for having Java Scripts/applets, music, or forms/CGI scripts on your site, since some users may not be able to use them and they take a long time to load on your visitor's computers. Links to other sites do not count towards this award. For more criteria please view our History page. Must have a valid contact e-mail address. The site should make Youth and Adults want to join your unit. The site should be useful to its Scouters. The site should have photos of youth in action. The site should have a way to contact the webmaster. The site should have unique content. The site should have a way to contact the adult leaders. The site should have a map to the location of the meetings. The site should have a calendar of events, past and present. The site should have a site map. The site is mostly links to other sites. The site can only be viewed with one browser. The site can only be viewed "certain" software.